What Level of RTLS Precision Does Healthcare Require? RTLS and RFID technologies are becoming more prevalent in today’s hospitals. Healthcare facilities are finding that the location awareness of staff, patients, and equipment is a pivotal component of clinical efficiency and enhancing the patient experience. We oftentimes hear numerous healthcare executives and clinical staff members inquire about the level of accuracy they would need from their RTLS solution provider. The question is often phrased “Will the accuracy be within (x number of) meters of its identified location?” However, it is important to note that in a clinical setting this estimated location, “within a few meters,” isn’t precise enough for many RTLS applications in healthcare. One meter, three meters, or five meters – all of these desired specifications still leave room for error and uncertainty. For example, one meter can mean the difference between an IV pump in a patient’s room, out in the hallway, or in a soiled closet. In many cases, the level of granularity required should not be an estimated distance, but rather the fact that – with 100% absolute certainty – an asset, patient or staff member is in or out of the clinically meaningful zone you have defined. This is what we call certainty-based or clinical-grade locating. 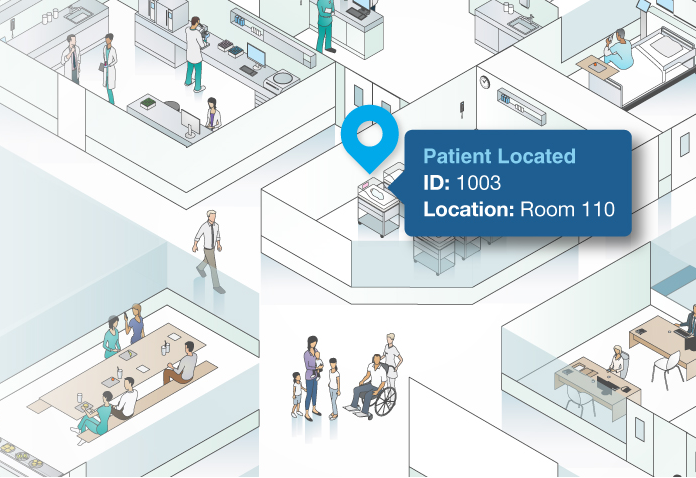 With a certainty-based RTLS platform, you can segment spaces such as patient rooms, beds, bays, nursing stations, hallway sections and other relevant areas to drive true workflow automation. Granularity, reliability and update speeds can vary widely by the RTLS technology type. Additionally, there is a hierarchy of locating needs, proceeding from zone-level locating and presence detection (most often achieved with an RF-only technology – e.g., Wi-Fi), to locating the current status of patients and staff, and finally to workflow enhancement where true process improvements can be facilitated. The more precise an object’s location needs to be pinpointed, more likely a certainty-based technology (e.g., Gen2IR™) will need to be utilized. Certainty-based locating identifies an objects position, within a defined clinical space and with high precision, even as it moves throughout the facility. It is this idea of required location accuracy that determines the correct RTLS solution for your medical center. Ideally, the RTLS solution chosen should not only meet the requirements for the current problem, but be flexible enough to grow from location tracking to contextual awareness. It should have the capability to segment spaces into clinically meaningful zones and integrate with other enterprise information systems — EMR, RIS and the like. Finally, it should have the capability not only to share data, but to aggregate, distill, analyze, and produce actionable information.